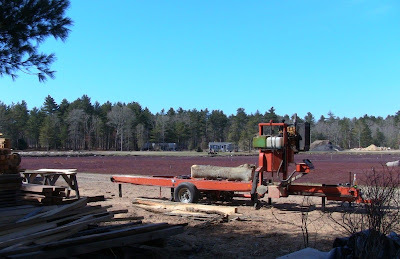 Paul Lelito's Wood-Mizer portable bandsaw mill, looking out across the cranberry bog. 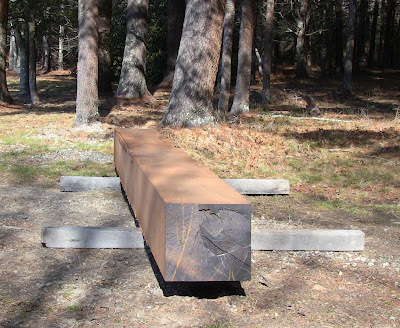 A holly log sits on it ready to be cut. 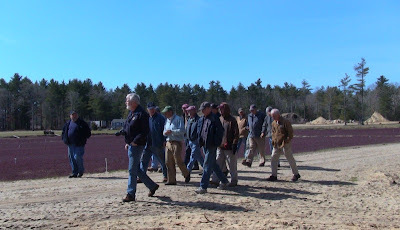 I got my first sunburn of the year on a gorgeous spring day at the April meeting of the Society of American Period Furniture Makers, New England chapter. 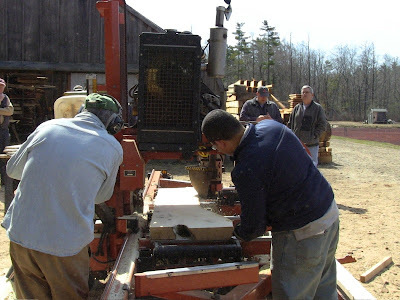 The topic was custom sawmilling, presented by Paul Lelito and Freddy Roman. 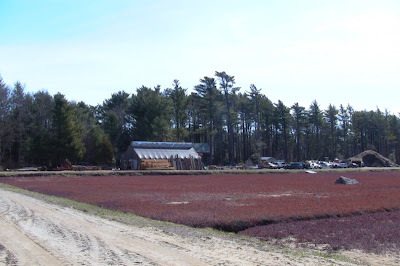 The location was Paul's site at the Magnolia Cranberry Bog, Marion, MA. 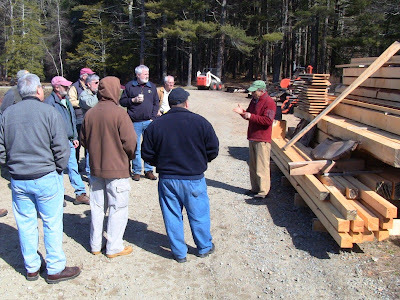 The attendees included SAPFM members from Massachusetts, New Hampshire, Connecticut, and Rhode Island, a mix of hobbyists and professionals. Freddy is the coordinator for the New England chapter. It also turns out he lives half a mile from me! So I offered to drive the 90 minutes to the meeting and haul lumber back in my van. This was the rain date, since the previous Saturday had been wet snow, and Freddy needed more people to sign up to cover expenses. Quite a change in the weather. Kudos to Freddy for pulling that off! Freddy represents the future of high-end woodworking. Not yet 30, he graduated from Phil Lowe's Furniture Institute of Massachusetts program 5 years ago. He specializes in furniture restoration and reproductions, particularly veneer, inlay, and banding, as well as commission work. If you have some fine antiques you'd like to have restored, you can reach him at 860-670-2584. Paul graduated from Phil's program 3 years ago, during which time Freddy was working for Phil teaching and doing museum restoration. 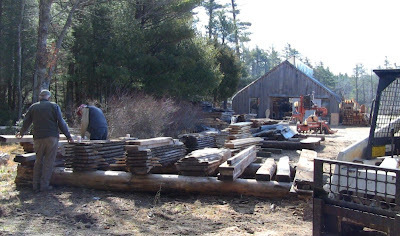 If you're looking for fine lumber, including beautiful full flitch sets, Paul has both seasoned and green, all air-dried. You can reach him at 508-451-9999. He's also available for custom on-site milling at a day rate. 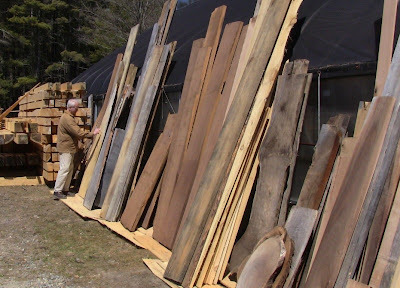 Paul was offering some good deals on lumber, so the first order of the day was prowling the stacks. In addition to flatsawn flitches, he does a lot of quartersawing. 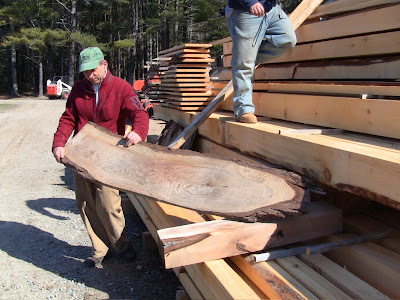 That's takes more time and produces more waste, but the resultant lumber is spectacular, especially in species with distinct medullary rays. Attendees examing some full flitch sets. My treasure find of the day was in the covered racks: quartersawn beech, cut in 2006. I've been looking for this for over a year now to make side-escapement molding planes. I have Larry Williams' planemaking and sharpening DVDs, and a stack of iron blanks from Lie-Nielsen. What have we here? 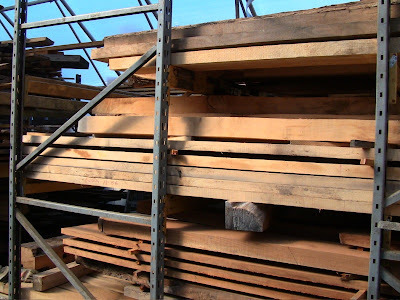 Quartersawn beech in the center rack, well seasoned and ready to work! I managed to control myself and just buy one board. Big gorgeous blocks of basswood. Freddy bought one of the big ones, and I bought one of the small ones. It has lovely figure in it, almost like bird's eye maple. A large walnut log squared up into a cant. Sawing this would be the afternoon project. Paul uses a Bobcat to move these things around. 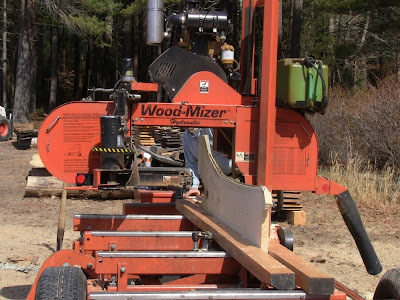 After some brisk commerce, Paul went over some of the problems and hazards of custom sawmilling. 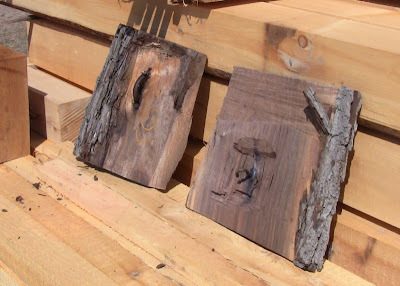 These included drying problems, items embedded in the wood, and operator errors. 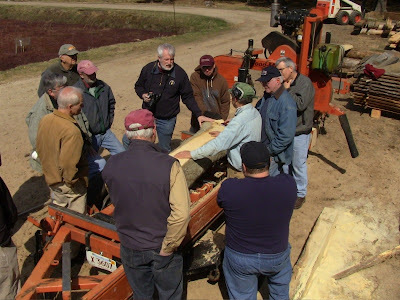 Paul presents sawmilling problems to the group. Behind him is a board that twisted up like a perfect airplane propeller when it dried. 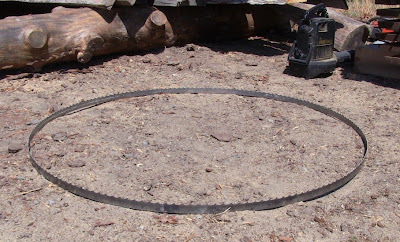 Some of the metal embedded in the walnut log: a pulley for a laundry line, and a large screw hook. These would destroy a blade. 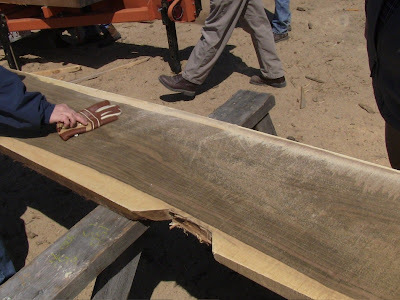 Excising them takes a big chunk out of the log, especially when the tree has encapsulated them over the years. Paul shows the result of trying to rush a cut: a wavy surface as the blade bowed by trying to force it through. He flipped it over to show the back, where he slowed down for the next cut. That had a fine flat surface. 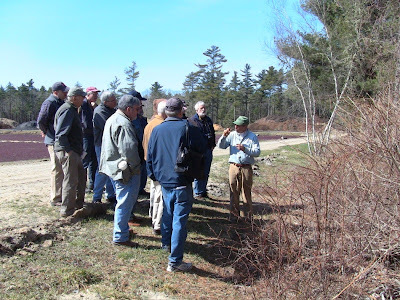 Next was a short walk in the woods beside the bog to talk about tree identification. Paul pointed out holly (the biggest holly I had ever seen before was just a decorative shrub), various pines, oaks, tupelo, and beech. He said tupelo was used in World War II era submarines for propeller shaft bearings. It's so tough, he said, you can bury a wedge in it and it won't crack. However, cut thinner and dried out, it eventually becomes very brittle. Paul talks about differentiating poison sumac from non-poisonous varieties based on its buds. Good to know before you go stomping through the brush with your chainsaw! The view back across the bog to the mill area. The group heading back. This is such a beautiful area, and most people just blow on by driving out to Cape Cod. Time to fire up the mill! For the morning milling, Paul had a short but large diameter log of holly. One of Freddy's goals for the day was to get some of this to use for inlay stringing. Holly is prized for its light color. It's also very expensive. After removing a bark slice, Paul discusses the blue discoloration that occurs rapidly in holly due to fungus. It needs to be cut thin and dried immediately. Paul, left, and Freddy, right, taking the final slice. Paul stood a bunch of the slices on their sides and cut them down the center to give everybody a piece to take home. 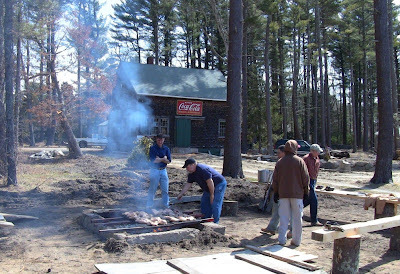 For lunch, Paul had a big firepit going with a huge pile of chicken on the grill. There were also salads, chips, cheeses, cookies, and brownies. Nobody went hungry this meeting! This was followed by a raffle, with more than enough prizes for everyone. Jae (John A. Ewart), who is both a professional woodworker and a professional chef, tending the chicken. Curiously, the old Coca Cola sign in the background is in French. The raffle prizes? Everyone got to pick a stack of lumber off the side of the shed. Don't let the weathered look fool you, this was all well-seasoned wood in a variety of species. A little surface cleanup will make is shine. Here Paul Williard examines the stacks. 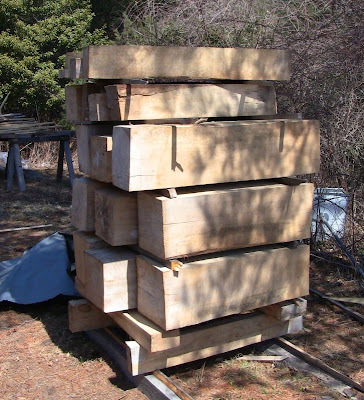 I got the stack with the short piece of walnut on the right, as well as some more beech. 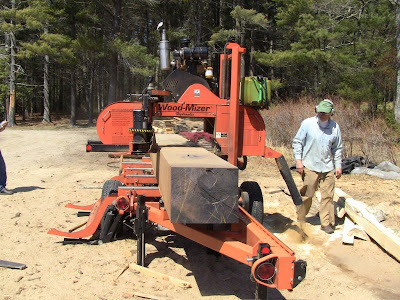 After doing the first half of the raffle tickets, Paul loaded the walnut cant onto the mill and started flatsawing. The length just fit on the rails. Taking the first slice. 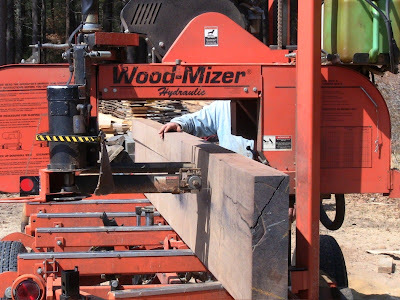 This model of mill has hydraulics for loading and manipulating the log, powered saw lift for precise thickness selection, and a chain-driven carriage. The kerf is wafer-thin for minimal waste. You want that in 4/4, 8/4, 12/4? No problem, name your slice. Even though Paul had removed all the nails he could find, there were still some deeper in the log. Here he points one out to be marked in the first board. 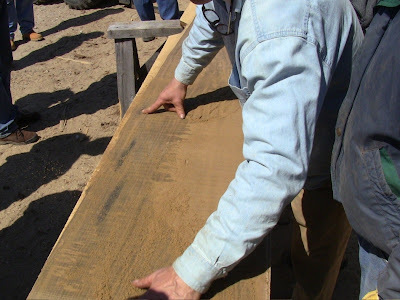 The iron in the nails reacts with the tannin in the wood to form black discoloration, almost like ebonizing dye. Changing out a saw blade. 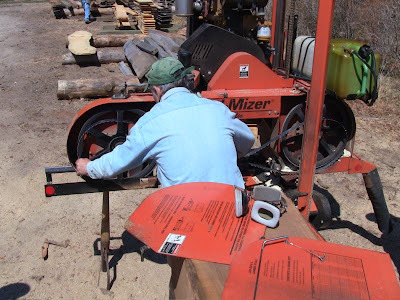 The sawyer has to decide if the value of the lumber than can be harvested outweighs the cost of dulled or destroyed blades. Paul buys them by the box and sends them for several resharpenings, but the expense adds up. In this case, the lumber is pretty valuable, so it's worth continuing. Paul digs out the remainder of the nail in the log as Freddy looks on. While this damages the wood, the surrounding discoloration means some defects will need to be cut out anyway when the board is cut up. When the blade hits a nail, in addition to damaging the teeth, it vibrates up and down, resulting in a rougher surface that will require more planing later. The color on the underside of the freshly cut board has a greenish cast along with the rich brown we normally associate with walnut. The seasoned walnut in the shed had such a reddish cast that I thought it was cherry. Freddy said that's the result of exposure to light and air during drying, but it's just surface color; planing will reveal its normal color. A dulled blade. The teeth on these are pretty sizable; I left the blower in the background so you can get some idea of the scale. The next blade only lasted one cut, due to more nails, of larger size. Ouch! That one was too heavily damaged, completely missing the tips of at least 3 teeth and several more severely beaten, so Paul gave it to me for blade stock, along with some old already broken up blades. Freddy and I are going to make framesaws out of it. I'll do one of Joshua Clark's Hyperkitten design, and maybe another using more traditional buckles, and see how it works out. Later I gave Paul $20 to help cover the cost of the blade because I felt bad about throwing it away so quickly. The boards starting to pile up on the sawhorses, stickered for air circulation. The final stack while leaving one big slab. There are 7 boards, each 28 square feet of surface. 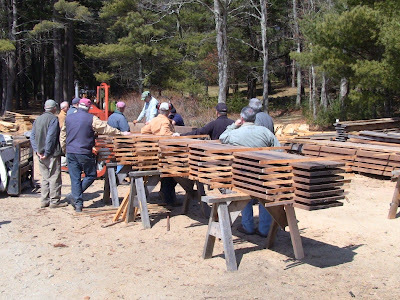 At 4/4, that's 28 board feet; at $10/bf, each board is worth $280, for a total of $1960 for the stack. I don't know what it cost to obtain the log, but it's worth the price of a few blades, even after cutting out damaged areas. Someone wanted to buy some large square stock, so Paul stood the remainder on its side using the hydraulics and took a cut. Chef Jae took the last piece for a workbench slab top (after a few years of drying), where the nail discoloration will add character. After this, Paul finished up the raffle and everyone left with big smiles. Freddy and I loaded up our swag, then helped Paul as he used the Bobcat to consolidate some stacks to make room for more incoming logs and get things covered up. 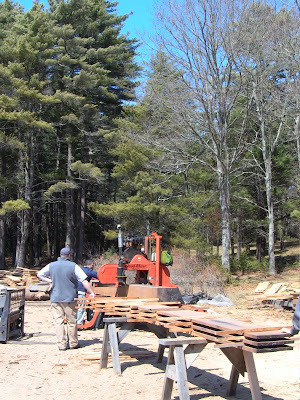 On the way home, Freddy and I stopped at his shop to unload his lumber. He's a partner with Will Neptune. The shop is located in Littleton, MA, right across the street from the building I worked in 15 years ago for Digital Equipment Corporation (which became Compaq, then HP, now IBM). Freddy showed me some of his bandings. These are complex sandwiches of contrasting veneers in a variety of patterns that are then sliced across in veneer-thickness bands and inlaid into larger pieces. Making them is very exacting work. Not many people would have the patience for it. The other thing he makes is harps! He showed me a finished one and several in progress. The work is more like boat-building than furniture: a few straight lines, but curves and odd compound angles everywhere. Placement of all the holes for string pegs and tensioners requires a large template. Freddy really impressed me. He's very committed to his craft, and holds himself to high standards. 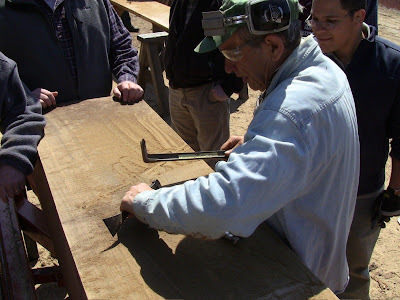 He told me some horror stories of poor restorations he's seen that reminded me of my 10-foot dovetails: looks OK from 10 feet or more away, but don't look any closer. Freddy's standard is more like a 1-inch distance: get right up close, and you can't see where the original leaves off and the restoration picks up. 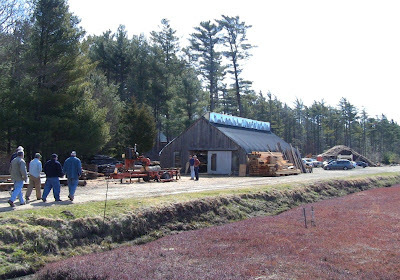 His willingness to run the SAPFM New England chapter is an example of his dedication. He works crazy hours as a self-employed businessman, yet is still willing to put in the time to make the NE chapter a success. The high-end work he does has a limited clientele in the best of times, and the current economy makes it even more challenging. But his priority for meetings is that everyone learns something and enjoys themselves. Next month's meeting features Peter Follansbee demonstrating 17th-century rived, carved, and pegged oak furniture at Phil Lowe's shop. I'm looking forward to it! Once again, I feel so fortunate to live in an area with so many excellent woodworkers, willing to share their talents, knowledge, and resources. Great post. That bandsaw blade demo... crazy! Thanks so much for sharing. I really liked the video, the description, and all of the pictures. Keep up the great work. Paul - you are truly amazing on your approach to living!